John Dutton Marriage to Margaret Roberts 25th December 1859. It is interesting to note in the marriage register that John was unable to read or write and signed by using X (his mark) Margaret, however, was able to sign and from all accounts was educated in domestic service. John worked on the land as an agricultural labourer and lived with his family in Saighton, with two younger sisters Mary Ann and Elizabeth. On the marriage license, John's age is recorded as 20 years old. Their first child was born in Saighton a few months later. Mary was christened in the same church where the couple had married. The baptism of Mary took place on the 19th February 1860. Shortly afterwards the family decided to leave the village and move to Roscoe Heath in School Lane Lower Bebbington. The move was to be short-lived opportunities for work had been scarce. John eventually obtained a job working for the Local Board in Wallasey. John and Margaret went to stay with their aunt Ellen Roberts at No9 Wallasey Terrace, (Twenty Row) on Leasowe Road. The above family tree shows John and Margaret's children. 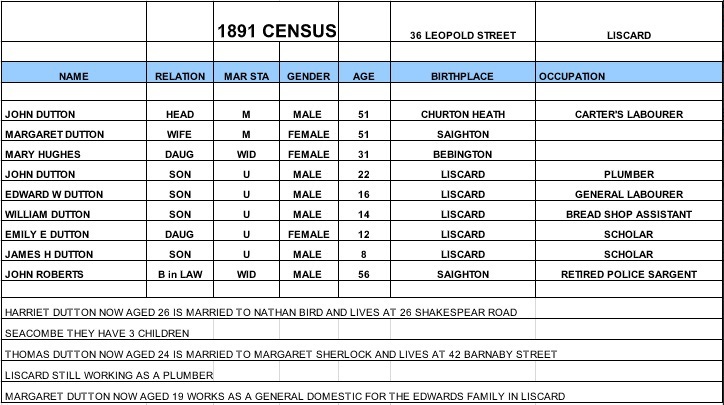 Eleven children are recorded, with Thomas Dutton my grandfather born in 1867. He died some eight years before I was born in 1939. This is the only known photograph of John Dutton, unearthed in Wallasey Central Library. The photograph shows the following members of the Wallasey Volunteer Fire Brigade. From left to right; John Fellows, James Lea, Robert Carson, John Dutton, James Leather (captain), Thomas Somerville and John Bleakley, with Harold Gibbons, the driver. I cannot give the exact date on which the brigade came into being, but think it was in the early eighties. John Fellows, James Lea, Robert Carson, John Dutton, James Leather (captain), Thomas Somerville and John Bleakley, with Harold Gibbons, the driver. The cottage behind the carriage stood at that time opposite the water tower in Mill Lane, the occupier at one time being John Pemberton and afterward Harry Keenan. All the men were plumbers or other tradesmen. Branches of the Brigade were formed, one at Seacombe, under Mr. John Howard, a tobacconist in Brighton Street, and another in Wallasey Village, under Abraham Halewood, one of the water inspectors. The Brigade made many good "saves" and well served the town as it was then, without any high buildings. When the fire took place at New Brighton Tower, one man (Shone) lost his life by falling from the top of the tower, being instantly killed. On one occasion a fire took place on a ship in the dock, and one of the firemen fell into the water. Dutton saw him fall but did not know who it was. He cried out "There's someone in the water." Suddenly a bald head was seen beneath the surface, and it was at once recognised as that of the captain Leather, and he was saved from drowning through his lack of hair. His brass helmet fell off and is still at the bottom of the dock. I am indebted to Mrs. Irish, of 11, Merton Road, for the loan of this picture. Mrs. Irish is the daughter of John Dutton, one of the firemen, and a milk dealer in Liscard Road, opposite the Tower Hotel. The Dutton family are old residents of Wallasey and are now in the fourth generation here. They came from Saighton, near Chester. Mrs. Irish is the widow of Edward Irish, one-time postman in Liscard, who served in the Cheshire Regiment (22nd Foot) and afterward in the "Greys"
Shortly after the Tower opened at New Brighton the directors offered a competition among squads of volunteers from different Infantry Battalions in Lancashire and Cheshire, and my squadron won first prize. The drill was manual and firing exercise and bayonet exercise, and Irish was one of the squad, Edward Fuller was another member, so probably I had an advantage over other leaders by having two Regulars in my squad. Of all the men in the picture, I do not think there is one now living. All have passed to their well-earned rest, but their families are well represented in Wallasey. Article from the Wallasey News found in a scrapbook in Wallasey Central Library, no date. On entry into Rake lane Cemetary opposite the cricket ground, on the third row. In plot, No 8c-185 is the grave of my Great Grandfather John Dutton. I would like to thank Gary Dutton born in Great Sutton in 1964, whose dad Derek Dutton born in 1931 was the oldest son of Frank Dutton who was the youngest of three son's of James Herbert Dutton. He supplied me with information in connection with our Dutton Ancestry.